Potted review: Unknown is a solid thriller with action, a bit psychological solid in all departments but unremarkable. 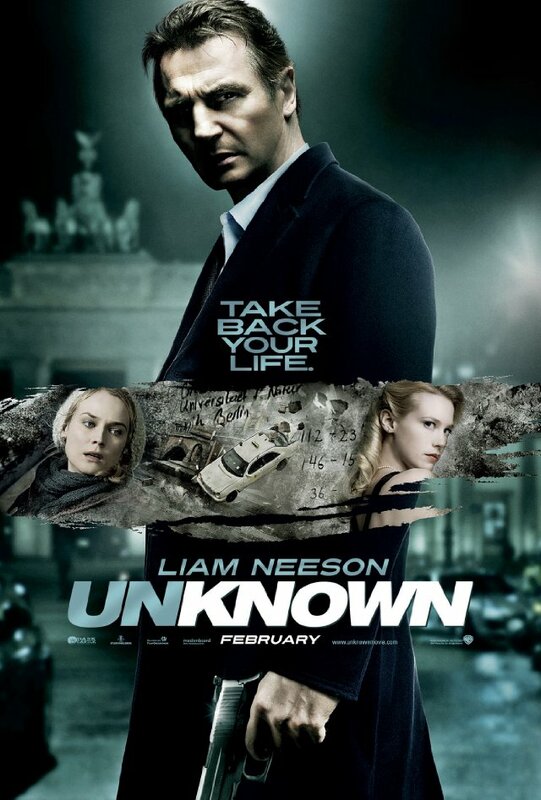 Back from going to see Unknown which falls into the thriller with some action and not straight action movie genre. Where The Adjustment Bureau, I reviewed last week, has been unfairly (in my book) compared to the Bourne trilogy – Unknown really ought to be. Dr. Martin Harris (Liam Neeson) is in a car accident and wakes up four days later with some sort of movie personality disorder, there is a conspiracy and there are secret agent at work: to me that is very much Bourne territory. If the film opened with the accident and waking up in hospital the amnesia / mistaken identity angle could have been the focus but since we know he is the real Martin Harris the focus is on why he’s being replaced and his frustration. There is quite a long build up to the first action sequence that I enjoyed but if you were looking for more action this would be quite frustrating. I could hear someone complaining about that loudly as we left that it could have been in Total Recall’s league. While I like Total Recall I prefer more of a thriller rather than a throwback to the action over thrills school of 80s action films. While I’d say this was slow it’s a lot faster paced than The American, which is still the most lackadaisical thriller I’ve seen in years. Once the pace does pick up later on while not unremitting it does keep moving. Unknown dropped in a moment of discontinuity that I couldn’t work out in the flash backs. I started to worry I was going to run into a moment of refrigerator logic like I do with Taken (where I can’t explain why a guy with contacts and a backer with a private plane goes in solo). It’s pretty obvious from early on that the film is going to have a twist. The discontinuity bothered me because I thought it was setting up one twist and fortunately it went with a more interesting one than I thought it was setting up. There are solid performances from Liam Neeson, Diane Kruger, January Jones, Aidan Quinn, Frank Langella and others. I particularly enjoyed Bruno Ganz’s ex-Stasi private investigator Ernst Jürgen who felt like he had slipped out of a John le Carre adaptation but not enough to be out of place. The action sequences were equally solid. Modern, well assembled but nothing breathtakingly original or new. One of the effects shots suffered from either the most unrealistic real flames ever or rather badly done digital flames add in post production but it wasn’t even close to being as glaring as the bad CG moments late in The A-Team. Overall Unknown is a good thriller with solid action when it’s doing action but not a full on action movie. In fact it’s basically a solid film in all departments. If I was being unkind I’d say this film is called Unknown but might also be called Unremarkable and in time it will probably become Unremembered. I’ll probably pick it up on DVD when it drops to the £5 or less level.